The World Health Organisation estimates that 360m people worldwide suffer from disabling hearing loss. This can lead to isolation through lack of communication and, with 32m children worldwide suffering hearing loss, this will also impact on their education and development. Hearing aids are one of the oldest forms of wearable electronics, but advances in circuitry and, more significantly, power management, are making them more convenient, smaller, lighter and less expensive. Today’s electronic hearing aid consists of a microphone, signal conditioning circuitry, a receiver (or speaker) and a battery. Maxim Integrated’s medical market technical expert, John Di Cristina, explains the basic workings of a hearing aid in an app note. The microphone converts sound into an electric signal, which is conditioned before the receiver converts the electronic signal back to sound. The battery powers the electronics within the hearing aid. Whether worn behind the ear, in the ear or in the ear canal, the hearing aid has to be light in weight and should be as discrete as possible. We have come a long way from the ear trumpets used to amplify sound! The power management in a hearing aid is therefore a significant component as frequent battery replacement is inconvenient at best. Although analogue hearing aids can now be programmed with multiple listening profiles to suit different environments, digital hearing aids allow more advanced signal processing, used to filter noise, reduce noise and control feedback. A large factor in the reduction of the size of hearing aids is the use of rechargeable, single cell, Lithium-Ion (Li-Ion) batteries in place of Zinc-air (Zn-air) batteries. Zn-air batteries had a limited lifetime, depending on battery capacity and the design of the hearing aid. A switching regulator can boost the voltage, points out Di Cristina. Rechargeable Li-Ion batteries may require a linear or switching regulator to step the battery voltage down to allow it to run on a typical 4.2V, single cell, Li-Ion battery. Other tools the designer can use are a battery charger to limit charging to say, 3.3V. A fuel gauge warns in advance when a battery will need replacing so that there is no discontinuation of the hearing aid’s functionality. Maxim Integrated offers ModelGauge battery fuel gauge ICs for battery management in what the company terms ‘hearable’ devices where power and battery management is essential but hampered by the need for very small batteries. They save space by not needing current sense resistors and other external components for power management in hearing aids. 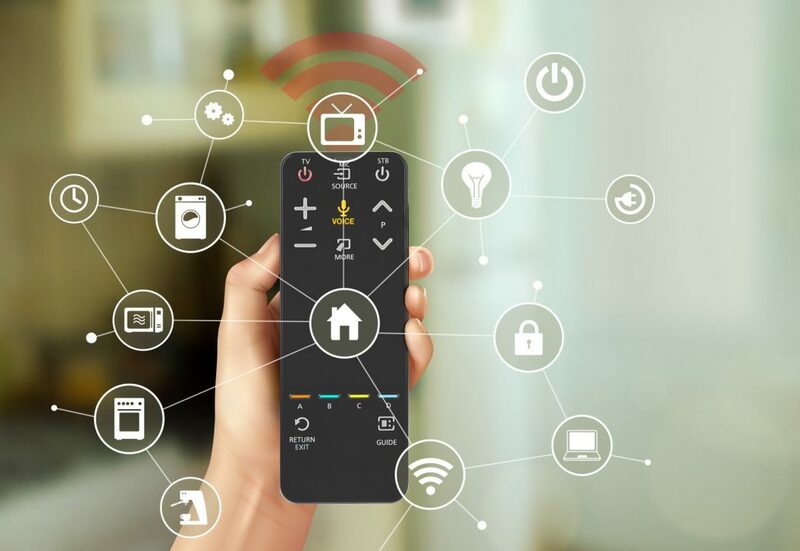 Further space is saved with power management ICs (PMICs) which integrate functions such as power regulation and charging. Maxim’s latest PMICs, the MAX77650 and MAX77651 save space with integrated regulators and chargers and have single inductor multiple output (SIMO) buck-boost regulators to provide three, programmable power rails per inductor, 150mA LDO regulators and three current sink drivers to reduce component count, minimise power dissipation and extend Li-Ion battery life. At 19.2mm2, Maxim says it is half the size of existing component combinations. 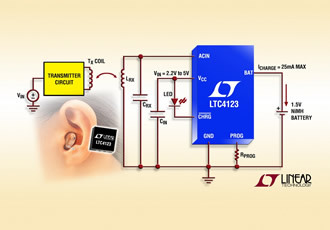 Linear Technology, now part of Analog Devices, has also addressed the power management of hearing aids, with a wireless charger-receiver, although the LTC4123 is aimed at NiMH batteries. The PMIC combines a wireless receiver with a constant current/constant voltage linear charger. A transmit coil generates an alternating magnetic field for wireless charging. Wireless charging means that the hearing aid can be sealed for a neat, compact design, without the need to replace the hearing aid’s primary batteries. To overcome a Li-Ion battery’s need for a step-down regulator, this charger has Zn-air detection, which allows it to work with both rechargeable NiMH batteries and primary Zn-air batteries using the same application circuit and without the need for additional voltage conversion. With hearing aid sales expected to grow by five percent between 2017 and 2023 (ResearchandMarkets), the design of hearing aids is going to ‘hot up’ as providers battle for convenience, reliability and longevity advantages.